The Book of Abramelin tells the story of an Egyptian mage named Abraham (pronunciation: (ɛ́jbrəham)), or Abra-Melin, who taught a system of magic to Abraham of Worms, a Jew in Worms, Germany, presumed to have lived from c.1362–c.1458. The system of magic from this book regained popularity in the 19th and 20th centuries partly due to Samuel Liddell MacGregor Mathers' translation, The Book of the Sacred Magic of Abramelin the Mage; and partly to its importance within the Hermetic Order of the Golden Dawn, and later within the mystical system of Thelema (created in 1904 by Aleister Crowley). Mathers used the least-reliable manuscript copy as the basis for his translation, and it contains many errors and omissions. The later English translation by Georg Dehn and Steven Guth, based on the earliest and most complete sources, is more scholarly and comprehensive. Dehn attributed authorship of The Book of Abramelin to Rabbi Yaakov Moelin (Hebrew יעקב בן משה מולין; ca. 1365–1427), a German Jewish Talmudist. This identification has since been disputed. The grimoire is framed as a sort of epistolary novel or autobiography in which Abraham of Worms describes his journey from Germany to Egypt and reveals Abramelin's magical and Kabbalistic secrets to his son Lamech. Internally the text dates itself to the year 1458. The story involves Abraham of Worms passing his magical and Kabbalistic secrets on to his son and tells how he acquired his knowledge. Abraham recounts how he found Abramelin the Mage living in the desert outside an Egyptian town, Arachi or Araki, which borders the Nile. Abramelin's home sat atop a small hill surrounded by trees. He was an Egyptian mage and taught a powerful form of Kabbalistic magic to Abraham. He was a "venerable aged man", and very courteous and kind. He discussed nothing but "the Fear of God", the importance of leading a well-regulated life, and the evils of the "acquisition of riches and goods". Abramelin extracted a promise from Abraham that he would give up his "false dogmas" and live "in the Way and Law of the Lord." He then gave Abraham two manuscript books to copy for himself, asking for ten gold florins, which he took with the intention of distributing to seventy-two poor persons in Arachi. Upon his return fifteen days later, after having disposed of the payment money, Abramelin extracted an oath from Abraham to "serve and fear" the Lord, and to "live and die in His most Holy Law." After this, Abramelin gave Abraham the "Divine Science" and "True Magic" embedded within the two manuscripts, which he was to follow and give to only those whom he knew well. The first printed version, also in German, dates to 1725 and was printed in Cologne by Peter Hammer. A partial copy in Hebrew is found in the Bodleian Library in Oxford, and dates from around 1740. A manuscript copy existed in French in the Bibliothèque de l'Arsenal in Paris, an institution founded in 1797. The French copy has since disappeared, but is available on microfilm. Another 17th-century manuscript in Italian exists in the 'Legato Martinengo' of the Queriniana Library in Brescia, Italy. It was part of the collection of the Count and Qabbalist Leopardo Martinengo of Barco and Torre Pallavicina. The manuscript, unknown for centuries to international researchers until 2009, has been found by academic researcher Maria Elena Loda in the esoteric section. At the moment, it is the only known manuscript translation in the Italian language of the Abramelin grimoire. 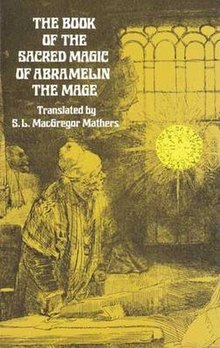 In 1897, The Book of the Sacred Magic of Abramelin the Mage was translated into English by the British occultist Samuel L. MacGregor Mathers. The magic described in the grimoire was influential in the Hermetic Order of the Golden Dawn, of which Mathers was the head. The British occultist Aleister Crowley, at the time a young member of the Hermetic Order of the Golden Dawn, started preparations for seeking the angel by following Abramelin's instructions, in Boleskine House, Scotland, but he abandoned this plan to assist Mathers during the Golden Dawn schism of 1901. As he developed the system of the A∴A∴, the Knowledge and Conversation of the Holy Guardian Angel was to become the fundamental task of every minor adept. Although Crowley would go on to create his own ritual for attaining this, while also saying that an adept could more or less achieve this mystical state in any number of ways, the fundamental concepts remained consistent with Abramelin. There are several important differences between the original manuscripts and Mathers' edition. First, one of the four books was missing entirely from the French manuscript with which he worked. Second, Mathers gave the duration of the operation as six months, whereas all other sources specify eighteen months. Third, possibly due to a mistranslation, Mathers changed one of the ingredients within the recipe for Abramelin oil, specifying galangal instead of the original herb calamus. The oil in the German manuscript sources also contains cassia and is nearly identical to the biblical recipe for Holy anointing oil. The differences between the recipes cause several notable changes in the oil's characteristics, including edibility, fragrance, dermal sensation, and spiritual symbolism. Fourth, there are 242-word squares in Mathers' translation, while the original German has 251. Most of the squares in Mathers are not completely filled in, and those that are differ from the German sources. A German translation, credited to Abraham of Worms and edited by Georg Dehn, was published in 2001 by Edition Araki. In the Dehn version, the fourth book is included and Mathers' galangal substitution is reverted to calamus (though not in the English translation — see Abramelin Oil). All 251 of the word squares are completely filled in. An English translation of Dehn's edition was published in 2006 by the American publisher Nicholas Hays. "Sacred Magic of Abramelin Index". www.sacred-texts.com. Retrieved 2017-05-08.
dhwty. "The Book of Abramelin the Mage, Esoteric Grimoire of Kabbalistic Knowledge". Ancient Origins. Retrieved 2017-05-08. "Full text of "The Sacred Magic of Abramelin the Mage"". archive.org. Retrieved 2017-05-08. "Sacred Magic of Abramelin the Mage". www.themystica.com. Retrieved 2017-05-08. Abraham eines Juden von Worms untereinander versteckte zum Theil aus der Kabala and Magia gezogene, zum Theil durch vornehme Rabbiner als Arabern un anderen so wie auch von seinem Vater Simon erhaltene, nachgehend, aber meisten Theils selbst erfahrene un probirte, in diese nachfolgende Schrift verfaste und endlich an seinen jüngeren Sohn Lamech hinterllaßene Künste: so geschehen ud geschrieben circa Annum 1404. Wolfenbüttel Library, Codex Guelfibus 10.1. Abraham ben Simon bar Juda ben Simon. Das Buch der wahren praktik von der alten Magia. Anno 1608. Wolfenbüttel Library, Codex Guelfibus 47.13. Cabala Mystica Aegyptiorum et Patriarchum. Anonymous. Staxon State and University Library, Dresden. MS N 161. Magia Abraham oder Underricht von der Heiligen Cabala. Signatur TS. Saxon State and University Library, Dresden. MS M 111. Abraham von Worms. Die egyptischen großen Offenbarungen, in sich begreifend die aufgefundenen Geheimnisbücher Mosis; oder des Juden Abraham von Worms Buch der wahren Praktik in der uralten göttlichen Magie und erstaunlichen Dingen, wie sie durch die heilige Kabbala und durch Elohym mitgetheilt worden. Sammt der Geister – und Wunder-Herrschaft, welche Moses in der Wüste aus dem feurigen Busch erlernet, alle Verborgenheiten der Kabbala umfassend. Köln, 1725. Sefer Segullot Melachim. Anonymous. Oxford University, Bodleian Library. MS. OPP.594. Book of Abramelin: A New Translation, Abraham of Worms, edited by Georg Dehn, Introduction, pg. XXV. The 1725 Hammer edition, first printed version. Carlos Gilly: Cimelia Rhodostaurotica - Die Rosenkreuzer im Spiegel der zwischen 1610 und 1660 entstandenen Handschriften und Drucke, Amsterdam, In de Pelikan 1995, S. 18-19 (the first critical discussion of the original manuscript of the pseudoepigraphical author Abraham of Worms, first written in German in 1608 and transmitted in codified form (Wolfenbüttel HAB, cod. guelf. 47.13 Aug. 4°, fols. 1r-31v), together with the corresponding decoding key (cod. guelf. 10.1.b Aug. 2°, S. 147). The manuscript is presented in its historical context and compared to the later, uncritical copies and editions). Maria Elena Loda: La Magia Sacra di Abramelin , in Misinta n° 31, Brescia 2009 ( critical article about the Italian manuscript of the Martinengo Collection ) e "Libri, Maghi, Misteri: il manoscritto di Abramelin nella Biblioteca Queriniana di Brescia. ", in Medioevo 216, Gennaio 2015 ( critical article with new details about the Italian manuscript of the Martinengo Collection ).